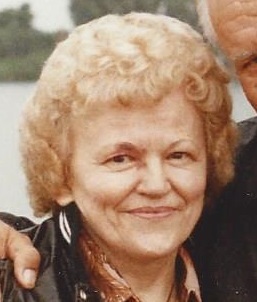 Anne Marie “Honey” Popiela (nee Marek) 94 of Munster, formerly of Whiting, passed away peacefully on Tuesday, January 29, 2019 at her residence. She was the beloved wife of 50 years of the late Casimir Popiela who passed away October 29, 2004; loving mother of Cindy Popiela, Karen (Edward) Hebda, Glori Whithorn and Darlene (Joseph) Markovich; cherished grandmother of Ashley (Nick) Sciacca, Matt (fiancé, Avonlea) Hebda, Ryan (fiancé, Ashley) Hebda, Catherine (Matthew) Fitzgerald, Chelsea (Peter) Milauskas, Brianna Whithorn, Drew (Amanda) Whithorn, Tiffany Whithorn, Chris, Holly and Michael Markovich; adoring great grandma of Caroline, Elijah, Tabitha, Lydia and Benjamin; many dear nieces and nephews. She was also preceded in death by three sisters, Helen (late John) Hajduk, Sophie Joan (late Frank) Plewniak and Julia “Jay” (late Joseph) Dickey and her brother, Stanley Marek. Funeral services will be held on Saturday, February 9, 2019 at 10:30am at the Baran Funeral Home, 1235-119th St., Whiting; a Mass of Christian Burial will be offered at 11:00am at St. Adalbert Church, Whiting, with the Rev. Stanley J. Dominik, officiating; interment, Holy Cross Cemetery, Calumet City, IL; visitation at the funeral home on Saturday morning from 9:00am to time of services. Honey Popiela was born on March 13, 1924 in Whiting, Indiana to Martin and Anna (Dybel) Marek. She was a member of St. Adalbert Church, Whiting and attended Whiting High School. Following graduation she went to work at the Marek Grocery Store and then at NIPSCO, retiring in 2001 with a service of 34 years. Honey loved her job at NIPSCO, playing solitaire and word puzzles and was known for her quick wit. A devoted wife, mother, grandmother and great grandmother, Honey will be sadly missed by all who knew and loved her. In lieu of flowers, memorials to St. Adalbert Church, Whiting, would be appreciated.